It was a policy born of good intentions but has stirred up perplexing, often painful, questions: What makes a person black, or white? Is it facial features? Hair? Family? Or an experience of racism? And who gets to decide? Ms. Chaves, 23, had worked hard to get through a degree program at the competitive federal university in Belem do Para, a port city on the Amazon forest's Atlantic coast. There were many tough tests along the way but she wasn't a bit worried about this final one. It was an exam to assess whether she qualified for a position being reserved for an affirmative-action candidate. Ms. Chaves knew she would sail through, because she is black. When the results were released a couple of weeks ago, the words next to her name read "not eligible." According to a racial evaluation commission for public-service jobs, Ms. Chaves is white and barred from the reserved spot. Ms. Chaves initially assumed it was an error. She cracked jokes to her mother – who is black – about how she must have been switched with a white baby at birth. But as she came to understand there was no error and she really had been classified as white, she found herself in a dizzying, dislocating state in which the most essential aspects of her identity were in question. "If I'm not black, what am I then? How do I prove to you something you can see when you look at me?" Ms. Chaves's surreal situation arises out a new effort in Brazil to reduce fraud in affirmative-action initiatives. The policy was born of good intentions but has stirred up perplexing, often painful, questions: What makes a person black, or white? Is it facial features? Hair? Family? Or an experience of racism? And who gets to decide? In 2012, Brazil's federal and state universities began to reserve a tranche of admissions for black and mixed-race students; since 2014, jobs in the federal public service have also had affirmative-action requirements – quotas, they are called here. The quota policy is a controversial effort at reparation, for slavery and hundreds of years of racial discrimination. After slavery was outlawed in 1888, Brazil had no explicit policies of discrimination, like the Jim Crow laws in the U.S. South. Instead the country cultivated an image of "racial democracy" where all were equal participants. But that, Ms. Chaves and many other black Brazilians say, was a myth. The effect of 140 years of systemic exclusion of black and mixed-race people, based on a hierarchy of skin tone, is obvious today. More than 52 per cent of Brazilians identify as black or mixed race, but they make up just 27 per cent of university students. The 25-person federal cabinet contains only white people (24 of them men); the 11-member bench of the Supreme Court is all white. Brazil's diplomatic corps, academic faculties and media institutions are overwhelmingly white. On every social indicator, such as life expectancy and literacy, black Brazilians have significantly lower scores than white ones. Quotas are meant to redress some of this: by helping students win access to the elite (and free) public universities, even though most come through an inferior public-education system; and by helping to make the public service more representative of the Brazilian population. Public-service jobs in Brazil pay significantly better than private-sector ones and come with a host of generous benefits such as meal and transport allowances; workers are rarely fired and can retire at age 55 with large pensions. Competition, consequently, is fierce. Candidates must pass a gruelling exam that some study for and take repeatedly for five or six years. Until August of this year, the quota system relied on candidates' self-identification of their race. That system was being abused, by white people claiming to be mixed-race (although researchers estimate that no more than 5 per cent of applicants were lying). Under pressure by some advocates from the black community, the government decided the solution was "commissions of verification" – tribunals that would evaluate each candidate. Guidelines from the Ministry of Planning said that panels should consider only physical attributes: "The forms and criteria for verifying the veracity of self-declaration should only consider the phenotypic aspects of the candidate, which will be checked in the presence of the candidate." That means that a panel of assessors (three, five or seven people) would look at each candidate and decide if their appearance matched their self-declared race. Last August, officials in Para, Ms. Chaves's state, released a chart of criteria for investigators to use, with a point system for physical characteristics such as "lips: thick," "gums: pink," "hair: frizzy." It caused such an uproar that it was hastily withdrawn. But no information has been disclosed about what criteria examiners are using instead. Some tribunals work purely from physical appearance; some panelists apparently see race as more than that and ask candidates about their experience of discrimination, or their families. The end result, frequently, is confusion. Ms. Chaves has no idea how the three people who made up her tribunal concluded she was white. Eduardo Sobral, 30, a geologist who says he is mixed-race, was rejected for a reserved position with the Ministry of Planning in Brasilia. He was examined by video-conference, then asked about his "day-to-day life as a brown person." He replied that it was "normal," the interview ended and he was rejected. He is suing the ministry. Rodrigo Campos, an electrician in the central state of Minas Gerais who says he is black, never even got before the assessors: They rejected him based on photos they asked him to submit. Meanwhile Igor Anatoli, a mixed-race police officer from Rio who is trying to join the diplomatic corps, went before a panel of seven in Brasilia in September; they chatted at length about his family and his experience of prejudice and ruled that he is, as he had declared, black. Activity during early morning on Ver-o-peso Market. Belm, capital of the state of Par, a port city and gateway to BrazilÕ lower Amazon region. Commissions are vital to ensure that limited affirmative-action spaces are not used by cheating white students, said Iuri Nascimento, an activist with a racial-equality advocacy organization called Negrex. Any argument that it's impossible to tell who is eligible in a country with a lot of mixed-raced people is simply aimed at undermining the system, he added. "If there is confusion over whether someone is black or not … ask if they have been told their hair is ugly, if they've been called 'monkey' at school, if the security guard always trails them at the mall," he said. Mr. Anatoli, the candidate for the foreign service who was confirmed as black by a tribunal, said his interview felt subjective, but then, he said, so were the psychological screening and the oral exam on his knowledge of international relations that were part of his application. He acknowledged that some people who self-identify as black may not be seen that way by the committee and be rejected – but if they don't look black enough to pass, they probably aren't experiencing discrimination either, he said. "If the identity is internal and it has no social repercussions, it's not relevant in terms of reparation from the state," he said. "The quota is for improving the life of a person who has suffered, for giving role models and for normalizing the presence of black people in these positions." If you don't look black enough to pass the tribunal, he said, you don't fit in those other categories either. There were seven people, of a mix of races and experiences, on his panel, he said, which meant that they had a diversity of opinions about the candidates – but in his case, "it's very obvious that I'm black." He finds the whole debate offensive: "We only debate who is black when we're talking about the democratization of public benefits," he snapped. "It's easy to identify a black person walking in the road – it's only a problem when a black person wants full access to society." Alexander Amaral, 38, spent two days evaluating the race of candidates for jobs at his Rio public-health research facility last month. His usual job is administering pensions at the Oswaldo Cruz Institute, but he was qualified to do the assessments, he said, because he lives as a mixed-race person in Brazil and is an activist with the black movement. "Looking at characteristics is the most objective way to do it … to make sure everyone has the same treatment," he said. "Brazil is a country with a lot of racial mixing and many times people have diverse forms of expressing themselves or how they see themselves. … But the only criteria we used are the candidates' appearance, because if we considered the stories of their lives, it would be too hard to check." His panel evaluated 18 people over two half-day sessions and rejected three. On most there was consensus, he said, but when there wasn't, the majority ruled, which makes it important to have a diverse group of evaluators. Three personal stories that show Brazil is not beyond racism Brazil’s national mythology is built on the idea of a democracia racial – a country whose population is uniquely mixed and has moved beyond racism. The lived experience of its citizens, especially the majority who are black or mixed-race, tells a different story. Three residents of Bahia, known as the country’s “blackest” state, share their personal stories with The Globe and Mail’s Stephanie Nolen. Yet there are many Brazilians – including other black activists – who think that the tribunals are a terrible idea. Petronio Domingues , a historian with the Federal University of Sergipe who studies the fight for racial equality in Brazil, said it's absurd to think that there are characteristics that can be evaluated objectively to determine race. "They're looking only at a person's appearance, and that doesn't define race," he said. "Any definition of what it is to be black cannot be external to the individual. … Race is a social construction, without scientific basis." Nor is there any evidence that proves that black people with very dark skin suffer more prejudice than those who are called pardo, or brown, he added, so it makes no sense to give more "points" to someone whose skin is darker or hair curlier. Prof. Domingues argued that the amount of fraud was so limited, it was within the tolerable range – but the mess created by the tribunals and cases such as Ms. Chaves's could jeopardize the whole affirmative-action project, which remains deeply unpopular with the mostly white elite. Mr. Sobral, the geologist, went before his panel in June. He had the top marks on the application exam, among affirmative-action candidates, and was feeling confident he would soon be on the permanent career track. But someone had provided his tribunal with pictures of a white man with the same name, he said, and when they contacted him by video, they clearly had their minds made up already. "I consider myself mixed-race," he said. "I feel like I'm brown, I live it, my culture is black, my family is black. … It's about how you see yourself, not how society sees you." But the tribunal wasn't interested. "I was labelled a [cheater] and I've been hassled because of it," said Mr. Sobral, still fuming. He has hired a lawyer and is suing the ministry "I feel wronged and helpless. … Everyone wants to judge me." Today the black movement in Brazil is divided over the value of the commissions. While many activists are fiercely invested in protecting the limited affirmative-action spots for someone who has been a victim of discrimination, others argue that letting the state define race is regressive. Charts like the one Para proposed, assessing lips and hair, are reminiscent of the tests the apartheid government of South Africa carried out to establish race, they say. "You have to preserve the principle of self-identification for black people in Brazil, the same as it is in many other parts of the world," said Paulo Rogerio, an activist in the black movement in the city of Salvador. Jacqueline Suellen Chaves at the Ver-o-peso Market. When Jacqueline Chaves turned up for her tribunal interview, the first panelist asked her how she identifies. She replied, "As black." The interviewer echoed, in surprised tones, "Black?" Next, Ms. Chaves said, the woman asked her what she thought about the quotas. Ms. Chaves answered that black Brazilians suffer prejudice, discussed the historical roots of the problem and said the quotas were to try to compensate. At that, the panel directed her into another room where she was photographed from several angles. "It felt unnecessary, photos of something that's clearly visible. It was embarrassing, being photographed," she said. She departed unsettled but convinced there could be no debate about her identity. And then came the rejection notice. Ms. Chaves believes she may have been "disqualified" from blackness based on her hair, which she chemically straightens from its natural tight curl. Black hair is a sensitive topic in Brazil, she said; natural black hair is colloquially referred to as cabelo ruim, or "bad hair." She said she was told all her life "You would be pretty if it wasn't for your hair" and as a teenager, she began to straighten it – something that some black activists, perhaps including some who sat on the tribunal that assessed her, believe negates Afro-Brazilian identity. Ms. Chaves is appealing the ruling that she is white – with the help of a former professor, a specialist in genetics, she submitted a fat dossier of evidence that she is, in fact, black, including pictures of herself as a child (with natural hair). She also opened a case through the public prosecutor's office, seeking damages for the embarrassment of being accused of lying and the psychological strain of the process. She remains torn about the need for the tribunals. It's important to control for fraud, she said. But the assessment must be both broader (including family history), and more transparent. "If they're going to evaluate me, I have to know what the rules are, how this panel was trained and what the criteria are." But even then, she isn't sure how the process could actually be made fair. "I don't think a panel should have the power to define someone's race. 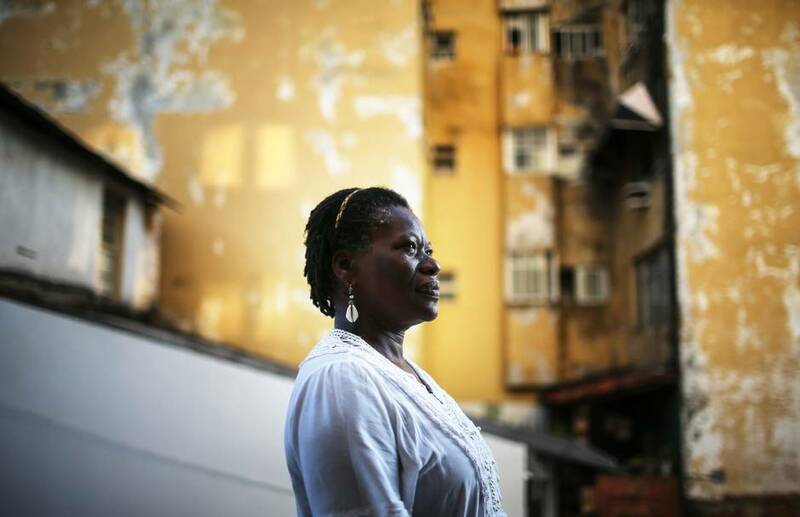 The issue of race in Brazil is extremely complex and it's extremely difficult to define," she said, weary, frustrated and, weeks later, still discomfited by the idea someone decided she wasn't who she thinks she is. "I don't accept the idea that three people can look at me and decide if I'm black or not." Editor’s note: Twenty-seven per cent of Brazilian university students identify as black or mixed race. An earlier version of this story said 5 per cent. This is a corrected version.